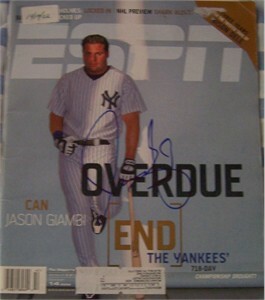 Complete 2002 ESPN The Magazine autographed on the cover in blue marker by former New York Yankees slugger Jason Giambi. NOTE: this is a former library copy with moderate wear and flaws including a date sticker in the top left corner and sticker residue in the top right corner. With certificate of authenticity from AutographsForSale.com. ONLY ONE AVAILABLE FOR SALE.